The Mark Harrington Show is a hard-hitting pro-life radio show that engages against America's vicious culture of death. The show has been broadcast throughout Ohio for over a decade. 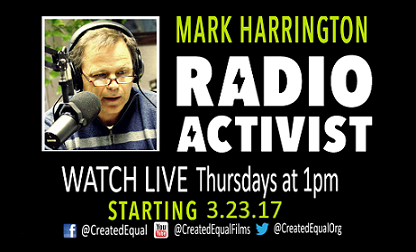 Mark Harrington, host of the show and President of Created Equal, is a long-time pro-life activist who aims to equip Christiansfor the front lines of the cultural wars and to defend their faith boldly in the public square. Created Equal, a pro-life training and outreach organization based in Columbus, Ohio, was founded by Mark in 2011. Prior to launching Created Equal, Mark served as Executive Director of the Midwest office of the Center for Bio-Ethical Reform and President of the Pro-Life Institute where he brought the Genocide Awareness Project to college campuses. Mark has advocated for the preborn on national media outlets, both newsprint—including USA Today and Washington Post—and television—such as CBS’ Good Morning America, Fox & Friends, and The Sean Hannity Show.